The International, Humanitarian and Independent Institution "Hope For Children" CRC Policy Center and Stoiximan Cyprus, the largest betting company in Cyprus, are “running” this year at the Radisson Blu International Marathon of Larnaca. 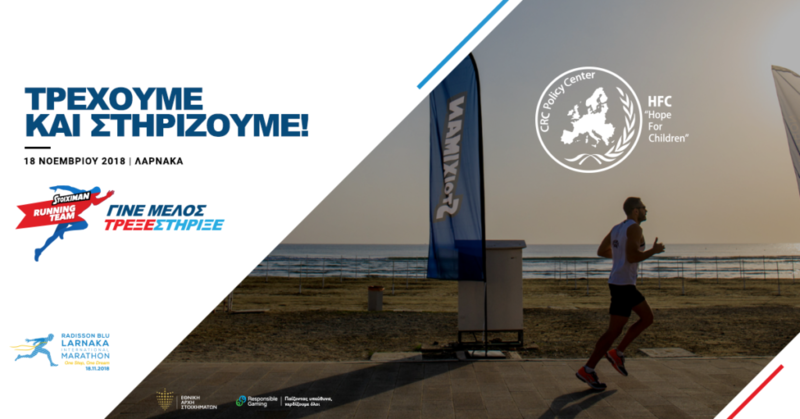 The Marathon, which is held for the second consecutive year, will take place on the 18th of November 2018 at 8:00 a.m., with starting point the Finikoudes Beach in Larnaca. The aim of this big sporting event is the financial support of "Hope For Children" CRC Policy Center and the strengthening of the work carried out by the Organization. The Stoiximan Running Team has already begun the preparations for the Marathon and is waiting for you all on November 18th to run together! You can also join and participate, spreading the message of fair playing through the following link: www.iroes.gr/stoiximan-running-team-gine-melos/ the latest by the 5th of November 2018. "Hope For Children" CRC Policy Center implements multifaceted humanitarian programs related to the promotion of children’s rights, prioritising their wellbeing, their education and the prevention of any kind of violence against children, as well as providing psychosocial and legal support. At the same time, HFC also focuses on the implementation of European funded programs that involve research, capacity building for professionals and policy making on issues pertaining children's rights. Stoiximan Cyprus participates this year at the Radisson Blu International Marathon of Larnaka and ... it bets that you will be there to support "Hope For Children" CRC Policy Center for a second consecutive year.